Recognizing a substantial improvement in the outlook for the labor market, the Federal Open Market Committee (FOMC) concluded its outcome-based asset purchase program in October 2014, having completed a total of $1.6 trillion in Treasury and agency MBS purchases over nearly two years. The Federal Reserve has continued to test operational tools that it can use to control interest rates with a large balance sheet, through a continuation of the overnight reverse repurchase agreement (ON RRP) exercise that began in September 2013, as well as through term RRPs and the Term Deposit Facility. The FOMC revised and augmented its communications around the approach it intends to implement when it becomes appropriate to begin normalizing the stance of monetary policy. The FOMC's forward guidance on the future stance of policy has changed. In March, the Committee reaffirmed its view that the current zero to ¼ percent target for the federal funds rate remains appropriate to support continued progress toward maximum employment and price stability. Noting that economic conditions were unlikely to warrant an increase in the target range at the April meeting, it advised that such an increase could be warranted at any later meeting, depending on how the economy evolves. My comments today will focus on the Federal Reserve's readiness to implement policy firming when directed to do so by the FOMC. In this context, I will discuss the Federal Reserve's ongoing refinement of its approach to policy normalization, with a focus on initial steps to leave the zero lower bound and some of the considerations that have directed the Committee away from a fixed-rate, full-allotment ON RRP facility. I will then review results of our testing, which inform our confidence in that approach. I will also discuss the Federal Reserve's flexibility to adapt its operational and analytical tools to the dynamic nature of the markets in which we operate. With the conclusion of the FOMC's asset purchase program last October and the ongoing reinvestment of principal repayments, the System Open Market Account's (SOMA) securities portfolio stands at $4.25 trillion. This portfolio is associated with some $2.9 trillion in excess reserve balance liabilities—a level at which the Open Markets Trading Desk (the Desk) will be unable to move the effective federal funds rate up or down with small variations in the supply of reserves, as it did before the financial crisis.2 Against this backdrop, implementation of monetary policy will require a new operational approach to influence short-term interest rates when the FOMC determines it is time to start raising them. The FOMC outlined its anticipated approach to policy normalization—that is, raising the federal funds rate and other short-term interest rates to more normal levels, and reducing the Federal Reserve's securities holdings—in a statement of Policy Normalization Principles and Plans published after the September 2014 FOMC meeting, with additional details provided in the March 2015 FOMC meeting minutes.3 In its September statement, the Committee noted its plans to reduce monetary policy accommodation by raising its target range for the federal funds rate. The Federal Reserve intends to move the federal funds rate into the target range primarily by adjusting the interest rate it pays on excess reserve balances (IOER), and will use an ON RRP facility and other supplementary tools, as needed, to help control the federal funds rate. The Committee noted that an ON RRP facility will be used only to the extent necessary and will be phased out once it is no longer needed to help control the federal funds rate. With respect to the Fed's balance sheet, the Committee intends to reduce securities holdings in a gradual and predictable manner, primarily by ceasing to reinvest repayments of principal on securities held in the SOMA.4 In the longer run, the Committee intends that the Federal Reserve will hold no more securities than necessary to implement monetary policy efficiently and effectively, and that it will hold primarily Treasury securities. The March 2015 minutes augment the September Principles and Plans with additional details about the FOMC's intended operational approach at the commencement of policy firming. Specifically, the Federal Reserve intends to target a range for the federal funds rate that is 25 basis points wide, and to set the IOER rate and the offering rate associated with an ON RRP facility equal to the top and bottom of the target range, respectively. It intends to allow aggregate capacity of the ON RRP facility to be temporarily elevated to support policy implementation. It can also adjust the IOER rate and parameters of the ON RRP facility, and to use other tools such as term operations, as necessary for appropriate monetary control based on policymakers' assessments of the efficacy and costs of their tools. The Committee expects that it will be appropriate to reduce the capacity of the ON RRP facility fairly soon after it commences policy firming. I'd like to explore some of these elements in more detail. First: IOER. The Federal Reserve began paying interest on reserve balances in October 2008; interest rates on required and excess reserve balances have both been ¼ percent since mid-December 2008.5 The Federal Reserve intends to use adjustments to the IOER rate—a rate it directly administers—as the main tool for moving the fed funds rate and other short-term interest rates into its target range. Second: An ON RRP facility. The FOMC will supplement the magnetic pull of changes in the IOER rate with an ON RRP facility to help control the federal funds rate.7 Under the facility, the Desk will offer general collateral reverse repurchase agreements at a specified offering rate to a broad set of counterparties—including several types of nonbank financial institutions that are significant lenders in U.S. money markets. ON RRPs, particularly if offered at full-allotment—that is, fulfilled for any amount demanded at the designated rate—are conceptually similar to IOER for banks in that they provide access to a risk-free overnight investment.8 An ON RRP facility can therefore help firm the floor beneath interest rates by widening the universe of counterparties that are unwilling to lend at rates below those available directly from the Fed. A facility can also help to alleviate some of the frictions that may curb the effectiveness of IOER in a system with large levels of excess reserves by enhancing market competition through a strengthening of large cash lenders' bargaining positions, and by reducing the amount of reserves held by banks and therefore associated balance sheet costs. Third: A 25 basis point target range for the federal funds rate bounded by the IOER and ON RRP rates. Framing the stance of policy in terms of the federal funds rate focuses monetary policy on a rate that is familiar to the public. Meanwhile, setting a target range, rather than a point target, is viewed as appropriate for providing some flexibility in interest rate control when the quantity of reserves remains elevated. As for the Fed's tools for policy implementation, setting the IOER and ON RRP rates at the upper and lower bounds of the target range is a straightforward arrangement at the start of policy firming.9 A spread of this size between the Federal Reserve's two administered-rate tools is expected to be narrow enough to provide sufficient interest rate control but wide enough to preserve a reasonable volume of trading in the federal funds market and to keep the Federal Reserve's footprint in the nonbank financial sector from growing too large. As suggested by operational guidance in the March minutes, policymakers may adjust either side of the spread between these two rates, as needed, once normalization is under way. Fourth: Qualifications around the use and settings of an ON RRP facility. The FOMC intends to use an ON RRP facility only to the extent necessary and will phase it out when it is no longer needed to help control the federal funds rate. But what is necessary, and how can the facility be phased out? As the minutes of recent FOMC meetings show, Committee participants differ in their answers to those questions, but all agree that demonstrating sufficient control over money market rates during the critical early stages of policy normalization is a priority. Against this backdrop, the Committee has noted that it plans to allow the aggregate capacity of the facility to be temporarily elevated to support policy implementation at liftoff, but also expects that it will be appropriate to reduce ON RRP capacity fairly soon after policy firming commences. While the $300 billion aggregate cap on ON RRP usage employed during exercise operations to date has generally provided sufficient capacity to establish a floor on the level of money market rates, it is difficult to know ex ante whether the same amount will be adequate once we move away from the zero lower bound. Providing capacity that market participants will judge sufficient to meet demand with a high degree of certainty can therefore enhance the confidence of policymakers and market participants that the facility will support short-term interest rates at the time of liftoff. In periods of financial stress, the availability of a fixed-rate, full-allotment facility could enable a rapid or unexpected expansion that exacerbates disruptive flight-to-quality flows by facilitating a run away from funding financial institutions and nonfinancial corporations. This dynamic could undermine financial stability. Separately, an ON RRP facility might affect the Federal Reserve's role in financial intermediation—particularly if it were permanently in place—by expanding the Federal Reserve's presence in short-term funding markets or potentially altering the structure and functioning of money markets in unanticipated ways.11 These risks are likely small given the sizable level of excess reserves currently in the system, which establishes the Federal Reserve's large footprint in money markets. 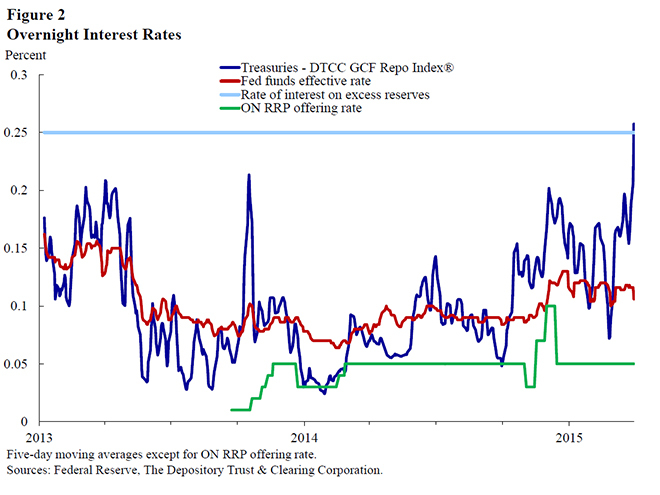 However, the risks associated with offering a perfectly elastic supply of ON RRPs at a fixed rate could increase as the level of excess reserves declines over the course of normalization and an ON RRP facility becomes less important to support interest rate control. These risks inform the Committee's desire to phase the facility out when it is no longer needed to control the federal funds rate. Indeed, money market rates should become more closely aligned with the IOER rate as the quantity of reserve balances in the system approaches greater levels of scarcity, likely reducing the need for supplementary support from an ON RRP facility. 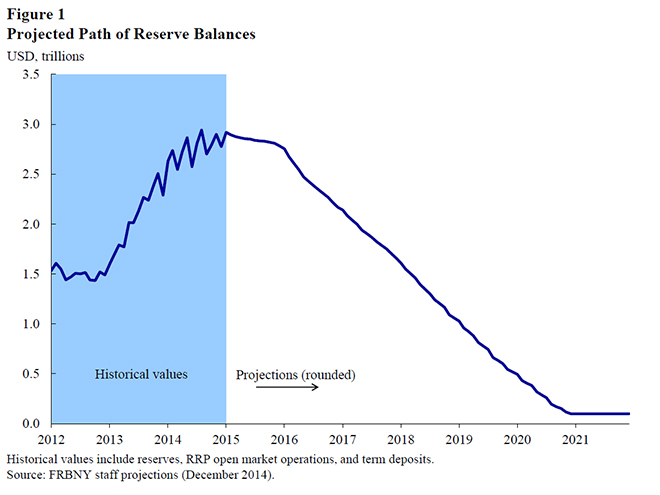 And since ON RRPs just swap one Federal Reserve liability for another—reserves for reverse repos—demand for RRPs should recede as the asset side of the Fed's balance sheet shrinks. There is, therefore, a natural “glide path” for the ON RRP facility to be phased out over time as the SOMA securities portfolio runs off and the size of the balance sheet is reduced to the smallest size needed for effective and efficient monetary policy implementation. In the meantime, we can introduce features into the facility's design that would limit its size even as it supports interest rate control. Examples include managing the spread between the IOER rate and the ON RRP rate to influence demand for the facility, setting a cap on the facility's size through individual or aggregate limits, and establishing an auction mechanism to allocate usage. If needed, the Committee can adjust these levers to discourage usage and shrink the footprint of the facility. The Committee has already directed the Desk to include some of these features in its testing. Finally: The FOMC noted that it is prepared to adjust the details of its approach to policy normalization in light of economic and financial developments. Flexibility is a critical element of the Federal Reserve's approach to policy normalization. Policymakers have said that they will adjust the IOER rate and parameters of an ON RRP facility, and use other supplementary tools as necessary—including term tools—during the normalization process. In doing so, they will weigh the efficacy and costs of each of the tools in their arsenal to ensure that they are optimizing policy objectives while maintaining appropriate interest rate control. I'll now explain our confidence in and readiness to implement this approach. Throughout the testing regime, the Desk has varied the settings and design of the reverse repo operations, with operational results informing subsequent changes. We've operated at different times of the day, increased the maximum bid limit per counterparty, and introduced an aggregate cap of $300 billion and a single-price auction mechanism to allocate awards should the sum of submitted bids exceed the cap. We've also adjusted the offering rates and tested ON RRPs in conjunction with term RRPs at quarter-ends. These adjustments have allowed us to learn how ON RRPs might be used to support the monetary policy objectives of the FOMC. Our testing has demonstrated that ON RRP operations can set a soft floor on short-term interest rates. That is, while some trades may occur below the ON RRP offering rate, the volume-weighted averages of most money market rates have been above the ON RRP rate on nearly all days (Figure 2). Data across a range of money markets provide evidence that changes in the ON RRP rate affected pricing for both unsecured and secured instruments and that the operations successfully set a floor on short-term interest rates. 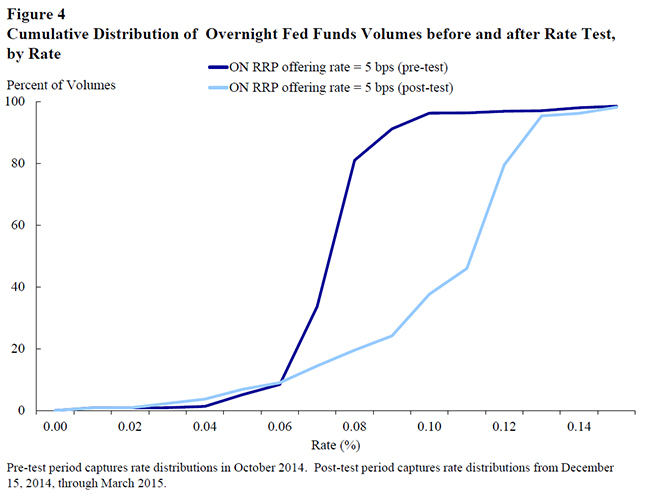 While market participants are aware of the success in producing a floor from such volume-weighted rates as the fed funds effective rate and GCF Repo Index®, the Desk has been also examining detailed transaction-level data for evidence that the ON RRP sets a floor on nearly all overnight money market transactions. A series of rate adjustments last November and December was particularly instructive in this examination. 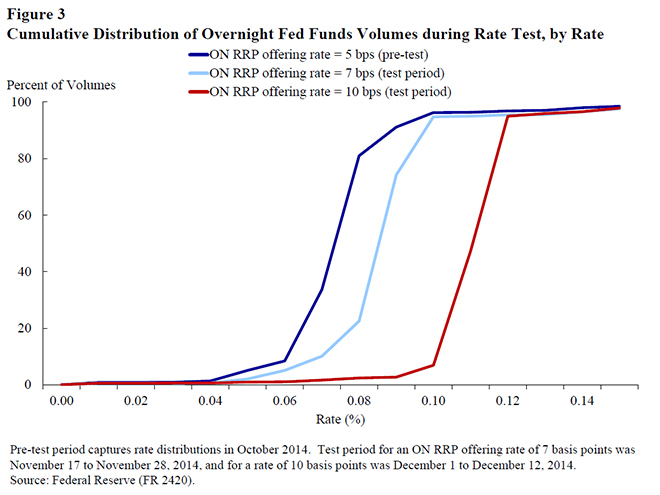 During the six-week test, the offering rate was temporarily lowered from 5 basis points to 3 basis points, then raised to 7 basis points and 10 basis points.16 The Fed's FR 2420 data on bank borrowing activity show that after each increase in the ON RRP offering rate, the distribution of fed funds trades shifted toward higher rates, with the vast majority of trades being executed at rates at or above the offering rate (Figure 3). 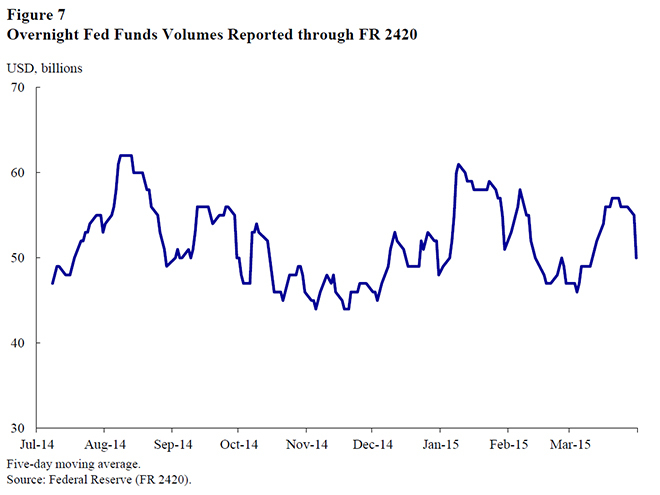 The same patterns were observed in detailed data on brokered fed funds and Eurodollar trades, the latter of which encompasses a larger volume and wider set of lenders than fed funds, and also in secured markets. 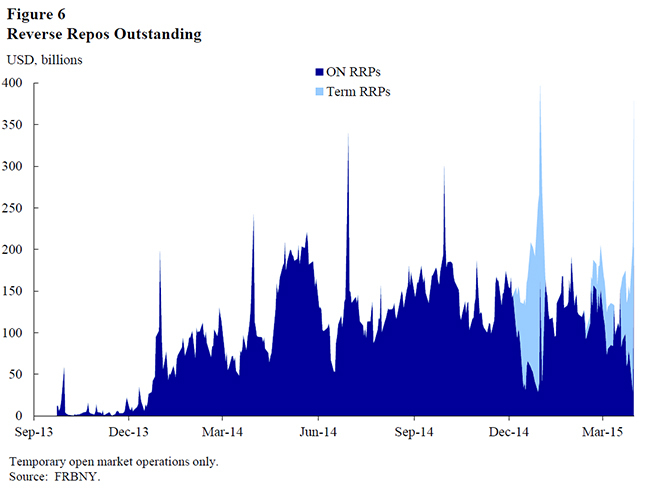 Examining in particular individual repo trades where money market funds and GSEs supply cash to counterparties over the tri-party platform, we saw repo rates shift higher and nearly all trading volume occur at or above the ON RRP rate. Thus, the rate on the ON RRP facility performed as a floor for nearly all overnight money market transactions, exactly as theory would predict for even small and temporary rate changes in the offering rate. Take-up, particularly for prime money market funds, substantially increases around quarter- and year-ends, when cash investors' access to other short-term investments can become more limited. All else equal, the decline in the supply of short-term investment alternatives can create volatility in market rates, so the Federal Reserve's ability to provide investment capacity through ON RRPs at these times may be important for monetary control. Tellingly, the only time the $300 billion aggregate cap on ON RRP operations was reached was in the September 2014 quarter-end operation, soon after the cap's introduction surprised market participants, leaving them searching for investment options when less than two weeks remained before quarter-end. Money market rates softened over that period as lenders sought to protect themselves against the risk of not having their bids fully filled in the Fed's quarter-end operation. Indeed, requested bids in the September 30 operation exceeded the cap by about $100 billion, some bids were only partially filled, and ON RRPs were awarded at a stop-out rate of zero percent. While our testing suggests that the current parameters of ON RRP operations have worked successfully with IOER to control short-term interest rates, there are limits to what we can learn from testing. Importantly, we will likely not know the level of support that proximity to the zero lower bound has provided to money market rates until we start to move away from it. Demand for ON RRPs following liftoff could remain relatively steady. But it could conceivably be much greater than what we have seen at higher levels of interest rates or as regulatory and structural changes in money markets boost demand for safe assets, which I will discuss momentarily. Additionally, having some excess capacity, also known as headroom, in ON RRP operations over expected usage is important for the facility's effectiveness in helping to control rates. One might want such headroom—which provides confidence to market participants that an ON RRP cap will not bind—to be somewhat higher on average if take-up in ON RRP operations becomes more volatile. Given the importance of a successful liftoff to the Federal Reserve's credibility, the FOMC has indicated an intention to set ON RRP capacity at a temporarily elevated level when policy firming commences to support policy implementation. As always, the Federal Reserve will monitor financial markets closely and make adjustments in its execution of monetary policy, as needed, to achieve its mandated objectives. The operational approach for policy normalization I described earlier refocuses the mechanism for implementing monetary policy back to money markets, after the post-crisis period in which policy has been driven by large-scale asset purchases. However, we will be operating in a complex, dynamic, and still-evolving market environment that looks much different from the money markets in which the Fed last operated actively to achieve its interest rate objectives. Still, these markets are no less important for the transmission of monetary policy or the broader U.S. financial system than they were before. In recent years, money market trading dynamics have changed, reflecting the effects of Fed monetary policy as well as other factors. The expansion of the Federal Reserve's balance sheet and the introduction of payment of interest on reserves have significantly altered the motivation for many fed funds trades.22 With an abundant supply of reserves available, banks' need to borrow funds to meet their reserve requirements or to clear financial transactions has been dramatically reduced. Meanwhile, entities that have surplus cash but are not able to earn IOER, such as Federal Home Loan Banks, lend funds at sub-IOER levels to banks that borrow them for the purposes of depositing them at the Fed to earn IOER. As a result, the size of the fed funds market has declined relative to pre-crisis levels and the nature of most fed funds activity has changed. Nevertheless, trading volumes remain reasonably robust. 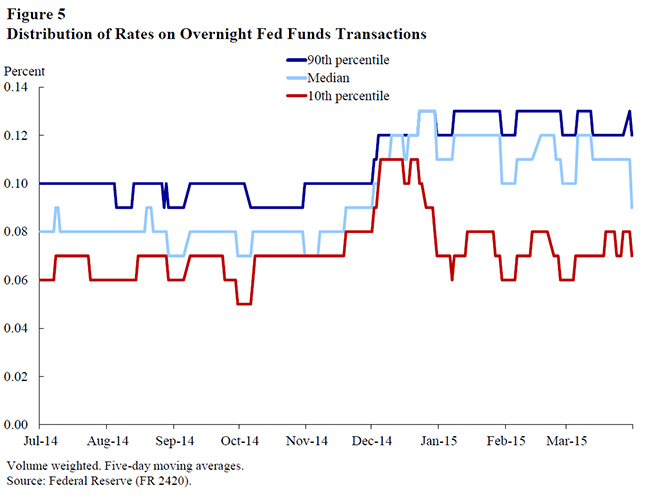 Since July 2014, the average overnight borrowing in the fed funds market that banks report to the Fed through our FR 2420 reporting form has been roughly $50 billion, with an average of about 300 transactions per day (Figure 7).23 Moreover, longer-term correlations between fed funds and other money market rates remain robust, with the fed funds rate remaining a suitable measure of banks' marginal borrowing costs. The effects of regulatory requirements on money market dynamics can be seen especially around key financial reporting dates. As many market commentators have noted, some borrowers actively manage their balance sheets on quarter-end dates. The perceived costs associated with new regulatory requirements on capital and liquidity ratios may further incentivize such behavior, particularly by foreign institutions. Borrowers' responses appear to contribute to the period-end dynamics I described earlier, including declines in money market volumes, increased volatility in money market rates, and elevated participation in the RRP operations as cash investors face temporarily reduced investment options from private counterparties. Importantly, the increase in RRP take-up can be understood as a consequence, rather than a cause, of private market balance sheet reductions on quarter-end dates. There have also been changes to the business models of many money market participants. Following the financial crisis, many financial institutions have sought to adjust their balance sheets to enhance their liquidity positions and reduce reliance on short-term wholesale funding. Cash lender business models have also adapted, with changes to some lenders' willingness to take credit risk. For example, Fannie Mae and Freddie Mac have not been active lenders in the fed funds market since 2011. Recent SEC money market fund reforms are beginning to change the landscape of the U.S. money fund industry and will likely influence investor use of prime funds relative to government funds or other investment options. Money fund reforms are one of many factors expected to increase demand for high-quality, short-term assets—a trend that will have implications for the relative pricing across different money market instruments and flows to different investment options, including Fed RRPs. We are also attentive to changes in money market infrastructure and technology. For example, the tri-party repo market has undergone significant changes in its settlement process and infrastructure since the crisis. Recent changes to the timing of settlement and maturity of tri-party repo trades have implications for market participants, such as making tri-party repo investments unattractive for lenders requiring morning return of funds. All these factors contribute to changing dynamics in money markets, with some potentially resulting in greater demand for Federal Reserve liabilities. In addition to developing new tools and approaches to operate in this environment, the Fed is also improving tools that support daily implementation of monetary policy and analysis of money market conditions. In April of last year, the Fed launched the FR 2420 Report on Selected Money Market Rates, a mandatory daily collection of fed funds, Eurodollar, and CD transactions from around fifty domestic banks and one hundred U.S. branches of foreign banks.25 The goal of initiating this data collection was to better understand institutional behavior in money markets, and indeed, as indicated in observations shared with you this evening, our findings have already helped us analyze results of our operational tests to prepare for normalization. These data also present an opportunity to make additional improvements in light of the recent international focus on identifying best practices for reference rates.26 Earlier this year, the Fed announced plans to improve the process for calculating the fed funds effective rate by transitioning the data source from data supplied by federal funds brokers to data reported directly by banks through FR 2420.27 The new data source includes more activity and transaction-level data, which will make the calculation process more robust. The Fed also announced it would begin daily publication of a second, broader measure of unsecured bank borrowing activity based on transactions in both federal funds and Eurodollars. This rate, called the overnight bank funding rate, will provide increased transparency on broad overnight funding costs for U.S.-based banking offices. In order to implement these changes, improve monitoring and analysis of unsecured money markets, and support supervisory objectives, the Fed recently proposed a number of enhancements to the FR 2420 data collection, which are intended to capture a larger share of fed fund and Eurodollar transactions.28 These enhancements would add about 30 new domestic institutions that are fed funds borrowers and lead to the collection of much more robust Eurodollar activity, including Eurodollar transactions from Caribbean branches that are managed and controlled by the U.S. offices of foreign banks. These proposed revisions are available for public comment until June 8, 2015, and implementation of the changes to the published rates will occur after revisions to the FR 2420 are complete, which is expected within a year. In conclusion, although the Federal Reserve will be removing its policy accommodation in a much-changed money market environment, the Desk is ready to implement policy firming when the FOMC determines that economic and financial conditions warrant it. The minutes of the March FOMC meeting outline the Federal Reserve's intended operational approach, and our testing program gives us confidence that we have the necessary tools to enable a smooth liftoff. The minutes highlight that policymakers will be particularly careful at the start because demonstrating appropriate control over the federal funds rate and other short-term rates is a priority. This may entail elevated aggregate capacity in an ON RRP facility at liftoff because we don't know how much support we are currently getting from the zero lower bound, which creates some uncertainty about the demand for ON RRPs. However, the ON RRP will be used only to the extent necessary for monetary policy control because it has some potential financial stability and footprint costs associated with it. Moreover, the Federal Reserve has a number of backup tools should things work differently than expected, and policymakers will make changes as necessary as normalization proceeds. 1 I would like to thank Julia Gouny, Deborah Leonard, and Eric LeSueur for their excellent assistance in the preparation of these remarks and colleagues in the Federal Reserve System for numerous insightful comments and suggestions. 2 This measure of reserves includes current balances of RRPs conducted under the Desk’s operational exercise and term deposits. In actuality, balances held in these categories shift the composition of the Federal Reserve’s liabilities away from reserves, although they don’t reduce the total size of the balance sheet. Note that the total quantity of reserves in the banking system is largely a byproduct of Federal Reserve activities (such as asset purchases or lending programs) and the private sector’s demand for other Federal Reserve liabilities (such as currency). Individual bank lending transactions can redistribute reserves, but they do not change the total quantity of them. See Todd Keister and James J. McAndrews, “Why Are Banks Holding So Many Excess Reserves?” Federal Reserve Bank of New York Current Issues 15, no. 8, December 2009. /research/current_issues/ci15-8.pdf. 3 The FOMC’s September 2014 Normalization Principles and Plans and March 2015 meeting minutes are available, respectively, at http://federalreserve.gov/newsevents/press/monetary/20140917c.htm and http://federalreserve.gov/monetarypolicy/fomcminutes20150318.htm. 4 The Committee further specified that it expects to cease or commence phasing out reinvestments after it begins increasing the target range for the federal funds rate; the timing will depend on how economic and financial conditions and the economic outlook evolve. The Committee said that it does not currently anticipate selling agency mortgage-backed securities (MBS) as part of the normalization process, but noted that limited sales might be warranted in the longer run to reduce or eliminate residual holdings. 5 Congress granted the Federal Reserve the authority to pay interest on reserve balances held by depository institutions in 2006, with an effective date of October 2011. The implementation of this ruling was accelerated to October 2008 during the financial crisis to enhance the Federal Reserve’s ability to control short-term interest rates amid the reserve-expanding credit programs and asset purchases it initiated at that time. Although the rates of interest on required reserve balances and excess reserve balances are currently equal, they need not be the same. 6 I spoke about these dynamics in December 2013 and October 2014 speeches, available at /newsevents/speeches/2013/pot131202.html and /newsevents/speeches/2014/pot141007.html. 7 When the Desk conducts a reverse repo transaction, it sells Treasury securities held in the SOMA under an agreement to repurchase the securities at a pre-determined price. The difference between the sale price and the repurchase price, together with the length of time between the two legs of the transaction, implies a rate of interest (the reverse repo rate) paid by the Federal Reserve to its counterparty. The transaction leaves the size of the SOMA’s securities portfolio unchanged, but shifts some of the liabilities on the Fed’s balance sheet from bank reserves to reverse repos while the trade is outstanding. 8 Unlike IOER, however, a full-allotment ON RRP facility would theoretically offer a perfectly elastic supply of a safe asset at a fixed rate. In practice, the amount of ON RRPs that the Federal Reserve could supply would likely be limited by the lesser of the level of excess reserves or the amount of securities available from the SOMA portfolio for such transactions. 9 The spread between the IOER and ON RRP rates should not be confused with the FOMC’s stance on monetary policy, expressed through a target range for the federal funds rate. Nor should it be thought of as a “corridor” operating framework for policy implementation. Within a corridor framework, relatively small changes in the supply of reserves can have a significant effect on equilibrium short-term rates, and the penalties and costs of holding too many reserves or too few reserves (set by rates on marginal deposit or lending facilities, respectively), generally limit the range of rate movements in the market. In an environment in which the supply of reserves far exceeds the demand, however, changes in the supply of reserves are not linked to movements in market rates. Instead, with elevated levels of reserves, the Federal Reserve’s operating framework more closely resembles a “floor” framework, in which interest rate control is established by directly administering a minimum rate (or here, a range of rates) in money markets. 10 A fuller discussion of the secondary effects of an ON RRP facility and options for addressing them can be found in Joshua Frost, Lorie Logan, Antoine Martin, Patrick McCabe, Fabio Natalucci, and Julie Remache, “Overnight RRP Operations as a Monetary Policy Tool: Some Design Considerations,” Federal Reserve Bank of New York Staff Reports, no. 712, February 2015. /research/staff_reports/sr712.pdf. 11 That said, to the extent that an ON RRP facility’s existence provides a credible outside investment option to money market lenders, it could potentially improve competition and support interest rate control even without large actual use of the facility. 12 These assumptions are derived from responses to the Desk’s Survey of Primary Dealers (December 2014), in which respondents expected liftoff to occur in the second quarter of 2015 and principal reinvestments of SOMA securities holdings to end two quarters later, and include a neutral assumption that the FOMC returns to a long-run operating framework with a relatively low level of excess reserves. Survey results are available at /markets/survey/2014/December_result.pdf. For more details on this projection scenario, please see the Report on Open Market Operations during 2014 (Federal Reserve Bank of New York, April 2015), available at /markets/annual_reports.html. 13 The payment of interest on reserves has been in place since October 2008, although the Federal Reserve Board recently requested public comment on proposed technical changes to the methodology for calculating IOER. The proposal intends to enhance the effectiveness of changes in the IOER rate in moving the federal funds rate into the target range when changes in those rates do not coincide with the beginning of a reserve maintenance period. Further information is available at http://www.federalreserve.gov/newsevents/press/bcreg/20150413a.htm. 14 With the addition of 25 expanded counterparties who were cleared to participate fully in RRP operations starting on March 16, 2015, the Desk’s 163 RRP counterparties comprise 141 expanded counterparties (105 money market funds, 12 government sponsored enterprises, and 24 banks) plus 22 primary dealers. A list of the Desk’s reverse repo counterparties is available at /markets/expanded_counterparties.html. 15 Consistent with the temporary nature of the ON RRP facility, the New York Fed does not expect to increase the total number of RRP counterparties further, unless the addition of new counterparties is deemed necessary to support the implementation of monetary policy. Thus, the number of expanded RRP counterparties is not expected to exceed 150. Additional firms that meet the eligibility criteria are allowed to submit applications, but will be added to the counterparty list only if the maximum number of expanded RRP counterparties has not been reached. On March 9, 2015, the Desk released a policy statement indicating that it could remove an entity from the RRP counterparty list for failing to meet prescribed eligibility and participation criteria. The statement is available at /markets/opolicy/operating_policy_150309.html. 16 An October 29, 2014, policy statement announcing the details of the test plan is available at /markets/opolicy/operating_policy_141029.html. 17 A similar dynamic is present in the brokered Eurodollar data. 18 Money market prices also appear to reflect some stickiness. Much money market activity is over the counter, potentially leading to search frictions and bargaining. Anecdotal evidence suggests that lenders typically interact directly with a small number of counterparties, perhaps because a portion of the activity is derived from costly relationship lending. These factors may contribute to imperfect competition. 19 Money market funds account for a substantial majority of take-up, and their participation is particularly responsive to rates on ON RRPs relative to those in the tri-party repo market. Government-sponsored enterprises account for the next largest share of take-up, with participation sensitive not only to market rates but also to non-price factors like their intra-month cash flow cycles. Not surprisingly, participation by banks and primary dealers tends to be more limited, because banks have access to higher-yielding IOER and primary dealers are typically net cash borrowers in the repo market. However, primary dealer take-up does increase when repo rates, particularly in the inter-dealer market, fall below the ON RRP rate. Take-up data by counterparty type, updated with a quarterly lag, are available under “Historical Data” at /markets/omo/dmm/temp.cfm. 20 In order to explore how term tools might be used more broadly during normalization, the Desk also conducted a series of one-week term RRP operations in mid-February through early-March 2015. The Federal Reserve has also continued to test its Term Deposit Facility, which provides a term investment option for credentialed depository institutions. Recently, TDF tests varied the rates and maximum awards and introduced an early withdrawal feature that provides favorable treatment of term deposits under the U.S. liquidity coverage ratio. 21 The December 2014 and March 2015 quarter-ends, respectively, had a total of $397 billion and $378 billion in awarded bids outstanding between term and overnight operations combined. These amounts are close to the $407 billion in bids that were submitted in the ON RRP operation at the September 2014 quarter-end, only $300 billion of which were filled. On non-quarter-end days, take-up has averaged less than $150 billion. 22 Although the currently elevated level of reserves creates unique temporary dynamics, the introduction of IOER, (which would have been implemented regardless of monetary policy responses to the financial crisis) represents a permanent change in the Federal Reserve’s operating framework. 23 Drawing on public filings of market participants, we estimate that this figure captures approximately 80 percent of all overnight fed funds transactions. 24 For foreign banks—the predominant borrowers of fed funds—the Basel III leverage ratios are largely calculated on a period-end basis. In contrast, the U.S. version of the ratio uses daily averaging. 25 The FR 2420 reporting form is available at /banking/reportingforms/FR_2420.html. An April 8, 2015, Liberty Street Economics blog post provides additional analysis, available at http://libertystreeteconomics.newyorkfed.org/2015/04/the-fr-2420-data-collection-a-new-base-for-the-fed-funds-rate.html. 26 For information on principles guiding this international work, please refer to the Principles for Financial Benchmarks, Final Report (The Board of the International Organization of Securities Commissions, July 2013), available at http://www.iosco.org/library/pubdocs/pdf/IOSCOPD415.pdf. 27 The February 2, 2015, statement regarding planned changes to the calculation and the publication of an overnight bank funding rate is available at /markets/opolicy/operating_policy_150202.html. 28 The proposal is available at https://www.federalregister.gov/articles/2015/04/07/2015-07920/proposed-agency-information-collection-activities-comment-request.